Bees are impressive creatures, powering entire ecosystems via pollination and making sweet honey at the same time, one of the most incredible substances in nature. But it turns out the little striped insects are also quite clever. 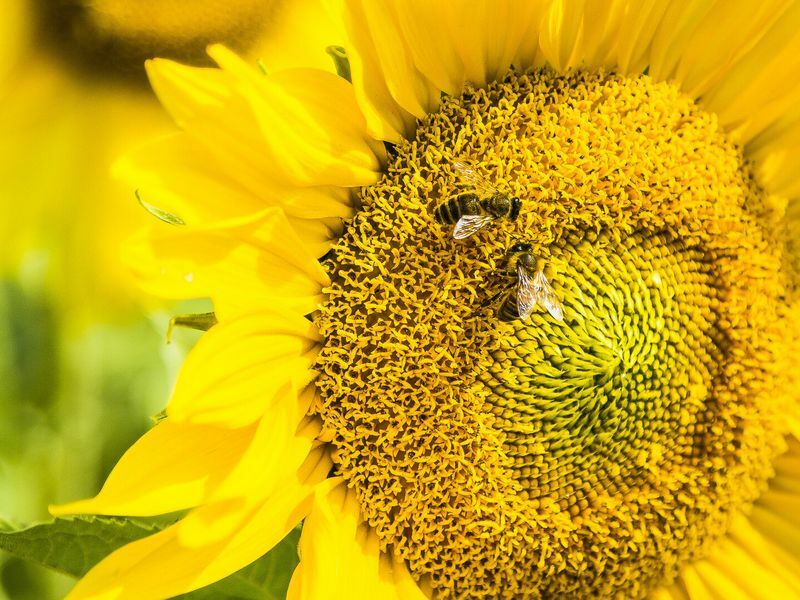 A new study suggests that, despite having tiny brains, bees understand the mathematical concepts of addition and subtraction. To test the numeracy of the arthropods, researchers set up unique Y-shaped math mazes for the bees to navigate, according to Nicola Davis at the The Guardian. Because the insects can’t read, and schooling them to recognize abstract symbols like plus and minus signs would be incredibly difficult, the researchers used color to indicate addition or subtraction. In the study, blue meant add one, and yellow meant subtract one. At the beginning of the maze, the insects would see, for instance, two blue squares. At the end of the maze, they were presented with a choice. In our example, the correct answer is three blue squares (add one), and if the bees landed on the correct answer, they were rewarded with sugar water. If they landed on squares representing the wrong answer, they would slurp up an unpalatable quinine solution. Fourteen bees spent between four and seven hours completing 100 trips through the mazes during training exercises with the shapes and numbers chosen at random. All of the bees appeared to learn the concept. Then, the bees were tested 10 times each using two addition and two subtraction scenarios that had not been part of the training runs. The little buzzers got the correct answer between 64 and 72 percent of the time, better than would be expected by chance. The research appears in the journal Science Advances. Last year, the same team of researchers published a paper suggesting that bees could understand the concept of zero, which puts them in an elite club of mathematically-minded animals that, at a minimum, have the ability to perceive higher and lower numbers in different groups. Animals with this ability include frogs, lions, spiders, crows, chicken chicks, some fish and other species. And these are not the only higher-level skills that bees appear to possess. A 2010 study that Dyer also participated in suggests that bees can remember human faces using the same mechanisms as people. Bees also use a complex type of movement called the waggle dance to communicate geographical information to one other, another sophisticated ability packed into a brain the size of a sesame seed. Then again, maybe the honey makers are getting more credit than they deserve. Clint Perry, who studies invertebrate intelligence at the Bee Sensory and Behavioral Ecology Lab at Queen Mary University of London tells George Dvorsky at Gizmodo that he’s not convinced by the research, and he had similar qualms about the study that suggested bees can understand the concept of zero. He says the bees may not be adding and subtracting, but rather are simply looking for an image that most closely matches the initial one they see, associating it with the sugar reward. Based on basic pattern matching, they should choose the correct image about 70 percent of the time, Perry says, which is line with the paper’s findings. It’s also possible the bees are cueing off something other than the number of shapes in the images, perhaps looking at surface area. “Bees are impressive and might be able to do arithmetic, but the results presented here do not convince me,” Perry says. Whether or not bees are mathematical savants, they are still pretty amazing creatures that play a vital role in ecosystem health. Bees' numbers are worth protecting, regardless of whether they are able to add or subtract. I wonder how many researchers sit around and invent things so they can get federal grants. That too is a learned response. And they can do math. Toss them a grant (sugar water) and they figure out how to keep it coming. Nobody said they are stupid. But bees seem to be smarter and much more useful. Usually don't unless ya piss 'em off! I try not to do that! But yes, they are very intelligent and adaptive for beeing tiny insects. If your looking for an exact number we'll have to ask the honey bees. They're good at math. They should ask the bees about climate change. Bet they'd find the bees think it's real. If there's a federal grant involved, you bet! I try not to talk to my bees, most of them are female, what could go wrong? Climate change didn't kill the bees. Bees like warm weather. Ergo, warmer weather would equal more bees. Lawn treatments and pesticides killed the bees.